Here's an Amazon FreeTime unlimited review for 2018 that compares the Kindle unlimited vs FreeTime unlimited content. At one time or the other, you must have heard of Amazon, patronized them, and shipped goods from Amazon to your country. Now, Amazon as an E-Commerce website for purchasing phones, computers, laptops, bags, accessories, kids toys, Music, eBooks amongst others has become the second most valuable company in the world after Google. The reason for this cannot be farfetched because this American based company has got all categories of consumers covered with its large electronic, fashion, and home collections for men, women, children, and babies. You need to know what Amazon FreeTime is because it gives you a clear concept of what Amazon is aiming at in this field. A free time is usually seen as a leisure time where one has little or no work to do, hence they can relax and entertain themselves. Amazon's aim is to seek ways on how to make your kids enjoy their free time by offering age-appropriate content with its FreeTime Unlimited plan. Amazon FreeTime is a free Children's application from Amazon for Android phones and Tablets, Kindle eReaders, Fire TV, and Fire HD Kids Edition Tablets. It consists of games, videos, characters, browser, and eBooks meant for kids between the ages of 3 and 12 years. A single app on any of the aforelisted devices can also support up to four accounts, where each child can log in and out of their profile seamlessly. Content such as videos and games can be viewed and played online, and it can also be downloaded for offline viewing when there is no internet connection. The major highlight is the Parental Control feature of the Amazon FreeTime app. Here, children can be restricted to certain content that involves violence, profanity, and sexual content, and also to the amount of time they can spend using the app. What if you could hand over a Tablet to a child without worrying about the type of content being viewed since control measures have been put in place? And what if you could get to determine how long each child stays glued to the screen before they are logged out? What is Amazon Unlimited FreeTime? Amazon FreeTime Unlimited is an optional monthly subscription that is required for the use of the Amazon FreeTime app for additional downloads of thousands of educational Apps, Games, eBooks, Movies, and many more. Depending on which type of Tablet the application runs on, you can either get a one month free trial period or a one-year FreeTime Unlimited as is the case of the 4th Generation Fire HD Tablet. Is Amazon FreeTime Unlimited free? You will have to pay a monthly subscription fee after a one month or one year trial period depending on which you were given. How much is Amazon FreeTime Unlimited? The price for Amazon FreeTime Unlimited subscription is $2.99/month for Amazon Prime members and $4.99/month for non-members. After subscription, you will have access to download from over 13,000 books as well as videos, audio, and games but if at a later date you choose to discontinue the service, you can get rid of Amazon FreeTime or unsubscribe. Apart from the parental control and time control features of the Amazon.com Kindle FreeTime, what other features does this app offer and most especially, is Kindle FreeTime unlimited worth it? My Interchangeably use of the words Kindle Unlimited vs Amazon FreeTime Unlimited means the same thing since Amazon FreeTime can be installed on Android Tablets or come pre-installed on Amazon Tablets. Correspondingly, what differs is the gadget (Android, Kindle, Fire HD) it is used on. So, what makes this app impressive? You cannot be with your child every hour, minute, and second of the day. That being the case, you cannot control what your child watches at all times, but with Amazon FreeTime, you can. Whether it's a cartoon, funny video on YouTube, or a game, they will definitely stumble on content with extreme language, sexual display, or a little bit too much horror for a child. With Amazon FreeTime, access to YouTube, NetFlix, and other video websites can be restricted but with enough access to videos like Nickelodeon and other TV shows. You can also monitor how long your child views content on their Tablet by setting a Time limit whose exhaustion logs the child out. The entire app where the app locks or shuts down after some minutes, hours, or when it's curfew time. Individual categories of the App such as Books, Games, Videos etc. that will lock after a specified time. Selected categories that can only be viewed after certain criteria have been met such as reading a book on the app for an hour before access to the video or games section is granted. An automatic lock put on the Amazon FreeTime app on selected days of the week where access to the app is restricted. Finally, set up user profiles for up to 4 four children. An Amazon FreeTime Unlimited subscription will allow your child to download several apps, videos, and games related to the ones they already have on the app. This means that you don't have to bother about new content they may download since the suggested downloads section has the same filter for kids within the same age grade and meet the requirements for apps you have made accessible to your kids. Instead of wondering how to get more Amazon FreeTime unlimited content such as books, funny videos, comics, apps and games to keep your kids interested in the app you can rely on Amazon's suggestion tool to do that for you. 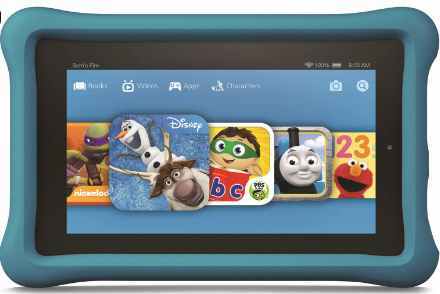 The large icons on the Amazon FreeTime Unlimited coupled with the search button give kids ease of navigation. When icons are very large, it makes it easier for kids with smaller fingers to navigate through pages easily. Now these icons showcasing their favorite characters such as Sponge Bob and Scooby makes it appealing to their eyes and very colorful. One area that may be of a major concern to your kids is the nature of videos, apps, and games offered on the Amazon Freetime. This will definitely not be a problem because there is a FreeTime Smart Filter that helps to filter appropriate content for a particular age grade, for instance, ages 3 to 5, ages 6 to 8, and ages 9 to 12. Where a younger child may fancy more of Barney-like cartoons and an older child, a bit scary cartoon. TV shows from Popular brands such as Sesame Street, Nickelodeon, Disney, PBS, and Amazon Originals for Kids are part of the Amazon Freetime Unlimited content. Is your child a selfie enthusiast? Then here's one more way you can encourage them to take more photos and customize them with stickers and drawings by getting them the Amazon Fire Tablet preloaded with FreeTime. Not only limited to photos, they can also record videos, and optionally upload these media files to Amazon's cloud drive storage. Parental approval must be gotten before kids are allowed to purchase apps, hence you do not have to worry about unnecessary payments you're unaware of. There are no links to Share content on social media, thus this may be seen as an added advantage since younger kids are most likely to share almost anything. You'll be in the best position to determine if paying $3, $5, or a $10 family membership fee per month for your kids to spend their leisure time with Amazon FreeTime is worth it. This Amazon FreeTime Unlimited Review will help you decide if you want to subscribe to get more features of the Amazon FreeTime such as the ability to download Videos, books, and apps from Amazon's-curated content. Nevertheless, your kids can still access educative material on the net, watch videos, listen to audio content, and generally, make the most of this app. Whether it is a 1-month free trial or monthly paid version of Amazon FreeTime Unlimited, you can offer your kids great content while at the same time monitor and control their screen time.